This debate is about as informal as they get, but doesn't suffer for it. Both speakers are highly articulate and well grounded in the designated subject matter, which is the existence of god and the problem of evil. Plantinga leads off with a basic restatement of the logical form of the problem of evil and notes that the philosophical community has more or less moved on to the evidential problem of evil. He goes on to claim that some of the classical arguments for god (e.g. cosmological and fine-tuning arguments) provide some evidence for the existence of a creator, and that such evidence should be weighed against the evidential problem of evil. Such arguments may be evidentially relevant to the amoral creator god of deism, but cannot be helpful as evidence for the all-loving god of classical theism. He eventually gets around to his own defense against the problem of evil, wherein he invents the idea of “no-see-ums” and posits the question of “whether god’s reasons are more like no-see-ums or more like Saint Bernard’s [dogs].” This is particularly ironic way of stating the problem since the latter is an actual canine, while the former is merely a clever concept made up by an apologist for the sake of illustration and persuasion. Um...yeah. Plantinga goes on to recall the story of Job, in quite some detail, which also strikes me as an odd move, given that the moral of that peculiar story is that if God has any good reasons for allowing evil, they are known only to God (and possibly Satan) but not revealed to humankind. This is not exactly encouraging to the field of theodicy as a theological enterprise. Nonetheless, Plantinga asserts that there must be good reasons that God permits evidently gratuitious suffering, and states on account of these unknown reasons, "I continue to believe in God and his goodness, and am entirely rational in so doing." He goes on to attempt a theodicy of his own, by providing reasons which might be part of the package of unknown reasons, and they are as follows: The key doctrines of Plantinga's religion (e.g. incarnation, resurrection, atonement) are incomparably good. Therefore, any world in in which Plantinga's religion is true is better than worlds in which it is not true. Therefore, the problem of evil isn't really a problem at all. Seriously, that's his argument. If Plantinga begged the question any harder than this, he'd be ticketed by the thought police. At any rate, the conversation starts to get geniunely interesting and insightful when Gale takes the stage around 36 minutes in, and starts throwing out questions and having an interchange of ideas. I'll leave it to the listener to judge, but it seemed to me that Gale did a better job of asking difficult questions than Plantinga did of answering them. Overall, this debate is worth watching. Share and enjoy! This debate went down in a curiously logic-free way (at least at first) since the opening statements seemed not to include anything like a cogent argument from either side. The closest that Wilson got was an appeal to the premise that naturally evolved biological neural networks are no better at processing information than fizzy cans of soda, an utterly ridiculous meme which nonetheless seems to be making the rounds. As I noted earlier, I cannot think of a chemical reaction more perfectly disanalogous to the amazingly complex processes studied by modern neuroscience than the shaking up of a can of soda – the only thing these things seem to have in common would have to be an abundance of carbon atoms. In any event, once these guys got past their opening statements, which were mostly paeans to the beauty and truth of their respective views and the depravity of the other guy’s views, they got into a genuine back-and-forth which was fairly fun to watch. Hitchens would do well to make most of his debates into mostly cross-ex with relatively little time upfront for openings and rebuttals. Hamza Tzortis leads off by quoting Dr. Craig’s argument #1 (Kalam cosmological argument), borrowing so heavily therefrom that he occasionally goes beyond homage to something more like reenactment. He manages to waste a bit of time over actual infinities here, but otherwise he does a fairly good job. As usual with the Kalam, the argument is founded upon an invalid equivocation to get us from "begins to exist" in the usual sense of the phrase (rearrangement of matter into a novel form, over time, via natural forces) to a completely unique cosmological sense of the phrase. Brian Layfield starts off with reminiscences of his childhood. (This is almost never a good sign.) He eventually gets around to a relatively robust presentation of the problem of human suffering, and throws in a few other tidbits. Adam Deen focuses upon provides us something very much like Dr. Craig's argument number #3, an argument from the existence of something he calls “objective moral truth,” and just like Dr. Craig, the argument here merely assumes submission to Authority is the only sort of universal morality worth considering. Coming from a Muslim (one who submits to Allah) this is not particularly a particularly surprising view. Also, since neither Tzortis nor Deen credit Craig for their arguments, I must wonder about whether they think there are any objective moral truths to be had on the topic of plagiarism. Robert Tee leads off, oddly enough, with radiometric dating of rocks and such, and goes on to make a several scientific arguments against creationism. I’m assuming that he is assuming that the theists in the room are primarily creationists, and for all I know he is correct about this. In any event, he gets nailed on cross-ex for taking this approach. Overall, this event isn't worth watching, but it does serve one useful purpose, that is, as a demonstration that generic arguments for a Creator Deity work equally well for any flavor of monotheism. Of course, this implies that such arguments tell us so little about the nature of the One True God, that we would have to go far beyond them in order to embrace some particular faith. Even if the arguments of Tzortzis and Deen went through (and I've already shown why they fail) they would at best admonish us to have faith in the god of Spinoza, Paine, and Einstein, rather than the God of Abraham, Jesus, or Mohammad. 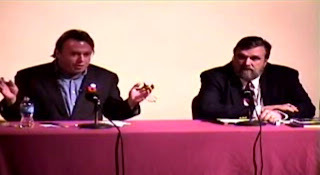 This debate (video, mp3) was a student produced event featuring student debaters from Brandeis Humanists and Brandeis Chabad. The religious side of the debate throws in a bit of natural theology (e.g. first cause) as well as arguments from revelation (e.g. Torah) and "morality" (i.e. blind obedience to Authority). It's the usual theological rubbish, and not even dolled up enough to look like philosophy. The irreligious side talks too fast at first, so I may have missed a couple of their arguments. Eventually, the first speaker commits the genetic fallacy on a global scale, which is a common enough tactic from amateur debaters such as John Loftus. The second debater leads off with the graveyard of dead gods, implicitly makes the argument that, with so many gods on offer, the apriori probability of following the one true religion is fairly low. He also alludes to incompatible properties arguments and presents a highly particularized presentation of the argument from evil, which was fairly well done. He also makes a few other arguments rooted in the nature of Scripture. This final speaker is by far the most effective debater of the day, and he also has a lot of fun interacting with the audience, which is fairly unusual for such events. Overall, this debate isn't worth watching. In case you are wondering why there are so few atheists and theists making the rounds around the professional god-debate circuit, this debate might help clear that up for you -- it turns out that it is hard to debate well and easy to debate badly. I think it is adorable and even admirable when amateurs take on great challenges, but not particularly enjoyable. Also, the audio quality is so poor that one ends up rewinding in order to hear poorly stated arguments more than once. Nonetheless, I praise both student groups for having a go at this, and I certainly hope more student groups attempt to put together such events. Consciousness raising can be its own reward.